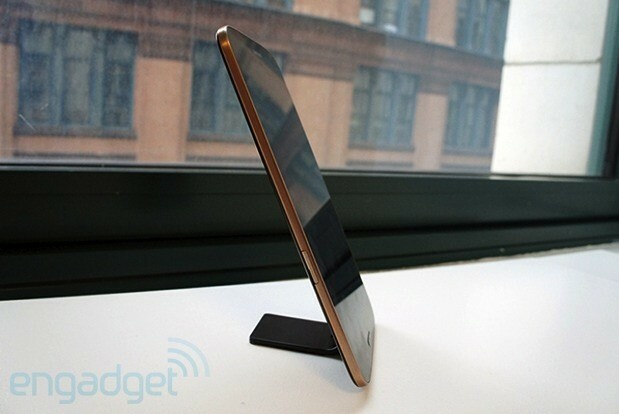 For all intents and purposes, eight inches is the new sweet spot for tablets. 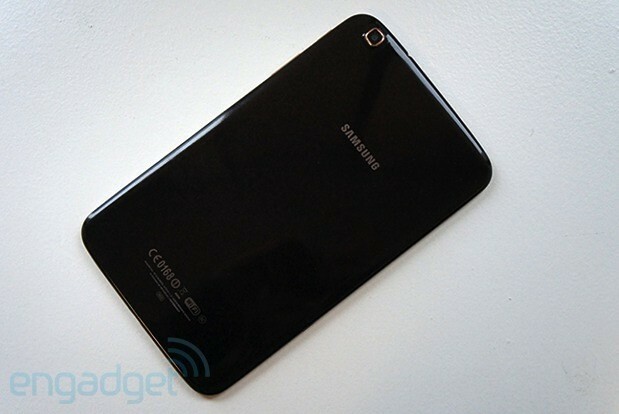 We've so far seen a few hits with this form factor, the Samsung Galaxy Note 8.0 perhaps foremost among them. It makes sense, after all; 10.1 inches can be unwieldy for travelers, and 7 inches scrimps a bit on screen real estate. 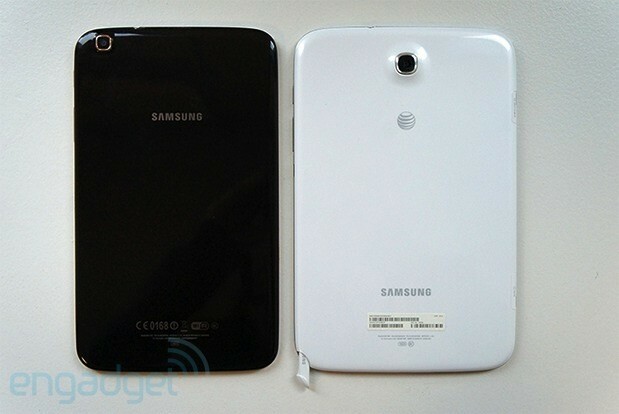 Samsung's leveraged this trend to add another 8-incher to its lineup: the $300 Galaxy Tab 3 8.0. With 16GB of built-in storage, a dual-core processor and WiFi -- but not LTE -- support, it's hardly revolutionary apart from those novel dimensions. Still, we've found plenty to like with Galaxy Tabs in the past, so is this yet another strong contender? Meet us past the break to find out. How would you rate the Galaxy Tab 3 8-inch? The Tab 3 8.0 may not have the name recognition of Samsung's Galaxy Note 8.0, but what it does have in its favor is a svelte, lightweight design. At 10.9 ounces (309.1g), it's comfortable to hold one-handed, and at just 0.29 inch (7.36mm) thick, it makes the 0.31-inch Note 8.0 look (and feel) positively bloated. While we appreciate that Samsung shrunk the bezels on this model, it does make it hard to grip the slate up top without touching the display; you'll want to hold the tablet at the bottom to avoid unintentional input. Incidentally, you'll also want to avoid gripping the tablet at the top so you won't hit the volume rocker on the upper-right edge. Slimness aside, the Tab 3 8.0 also feels more premium than the Note and even the last-gen Tab 2 line, thanks to those skinny bezels and a brown-black hue done up in a dimpled pattern. While we're not huge fans of this color -- our very own Joseph Volpe calls this shade "scab brown" -- it's not as reflective as Samsung's usual white and black options, meaning the tablet's plastic build is a little more pleasing to look at. (Should you prefer a more standard color choice, you can always opt for the white version.) This textured finish also helps mask the fingerprints that will inevitably grease up the tablet's backing, though you'll still want to wipe down the tablet regularly. Another sweet touch: the bronzy faux-chrome trim lining the tablet, which adds a bit more flare than the standard silver trim (which you'll still see on the white Tab 3 8.0). This flourish carries over to the Tab's backside, where the 5-megapixel rear camera is surrounded by the same material. 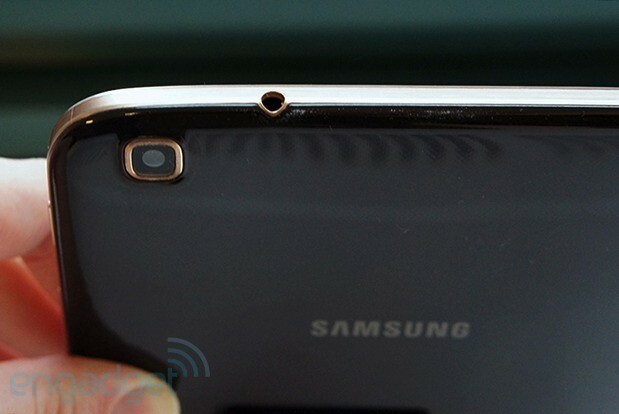 We've just about covered all the surprises on the Tab 3 8.0: port placement is par for the course, as is the Samsung branding sitting both atop the touchscreen and in the middle of the device's non-removable back cover. On the front of the device, you'll find a 1.3-megapixel camera up top, while the physical home button sits below the display, flanked by capacitive keys for settings and back. A microSD slot sits on the left edge of the slate, while the power button and volume rocker line the right side. The right edge is also home to an IR blaster, which lets you use the tab as a remote control for your TV. Samsung's been pushing this feature on several tablets, including the new Tab 3 10.1 and the Galaxy Tab 7.0 Plus from almost two years ago. As usual, the headphone jack sits on the top edge, while the micro-USB port sits on the bottom along with two mini speaker grilles. Samsung used a 1,280 x 800 (WXGA) TFT LCD panel for the Tab 3 8.0, and that resolution makes for a fabulous viewing experience. Images and text are perfectly crisp, and colors look reasonably vibrant as well. On top of that, viewing angles are nice and wide, though you'll have a harder time using the tablet in direct sunlight; the panel is definitely glare-prone.The 10.1-inch version of the Tab 3 also packs a WXGA resolution, which means the Tab 3 8.0's panel has a higher pixel density (148 pixels per inch versus 189). 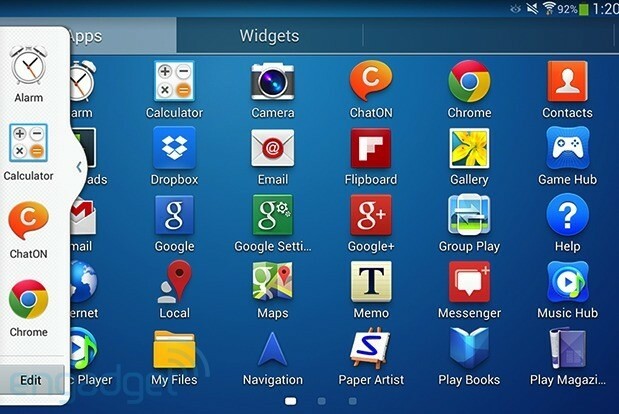 Running Android 4.2 (Jelly Bean), the Galaxy Tab 3 8.0 offers a few standout features along with the standard suite of Samsung apps. These include Peel Smart Remote, which utilizes the tablet's IR blaster to control your TV, and the recently introduced Smart Stay for detecting when you look away from the screen and pausing and resuming your videos accordingly. Notably, Smart Stay is the only "Smart" feature to make it over to this tab -- most of these bells and whistles live exclusively on the GS 4, at least for now. For the most part, Samsung leaves the app-collecting to you, only loading up the Tab 3 8.0 with a handful of pre-selected programs. These include Dropbox, Flipboard and TripAdvisor along with the expected parade of Samsung programs (ChatON, Game Hub, Group Play, S Voice, S Planner, WatchON -- you know the drill). While the Tab's older sibling, the Tab 3 10.1, packs a 3.2-megapixel rear camera, we get a 5MP shooter to play with here. Many people will appreciate the simple camera UI, which offers a straightforward settings menu on the right-hand side of the screen. The camera app gives you several modes for snapping pics: the self-explanatory Auto, Beauty Face, Night, Panorama, Sports and Sound & Shot. Our sample shots deliver accurate, if not entirely vibrant, colors, though images tend to look a little fuzzy. You'll want to avoid shadier, darker environments, as we didn't have much luck in those conditions. Overall, the shooter will do in a pinch, but you're much better off with a standalone point-and-shoot (as if you didn't know that already). You can also shoot video in 720p, but don't expect extremely fluid movement. Our sample clip looks quite jerky, and autofocus didn't do a great job at making objects look crisp. On the upside, audio came through loud and clear, with limited background interference. Finally, there's a 1.3MP front camera, which is adequate for selfies (if you must) and video chats. We look a bit washed-out in our sample shots, but that's to be expected. With a 1.5GHz dual-core Samsung Exynos 4 processor and 1.5GB of RAM, the Tab 3 8.0 is no match for slates running higher-end silicon. When we first powered on the tablet, the system was a mess of hiccups such as force closes and several seconds' delay in response. We weren't exactly thrilled at the prospect of using the slate after those first few minutes, but luckily the going got smoother soon after. That's not to say you won't encounter the occasional stuttering or freezing; as we found with the Tab 3 10.1, everyday performance is frustratingly inconsistent. The camera app seems especially prone to upsetting the tab; it force-closed on us at least five times during our few days of testing. On our battery test -- which involves playing a local video on loop with WiFi on and brightness set to 50 percent -- this Tab's 4,450mAh power pack lasted seven hours and 19 minutes. That's on par with the Galaxy Note 8.0, the new Nexus 7 and the HP Slate 7, though a couple 7-inchers like the ASUS MeMo Pad HD 7 and the Hisense Sero 7 Pro last several hours longer. Of course, you can expect more longevity with more moderate use; we easily got through a full day with occasional emailing and light gaming, for instance. When you can take home the Galaxy Note 8.0 with its superior performance and S Pen for just $100 more, the Tab 3 8.0 is a bit of a tough sell. Yes, the latter does offer a thinner design and runs Android 4.2 rather than the Note's Android 4.1, but those advantages only tip the scale so much. If you want to stay within Samsung's galaxy, we'd say you're better off going for the Tab 3 8.0 than the pricier Tab 3 10.1, as its smaller size makes it a more compelling travel companion and the difference in performance is negligible. 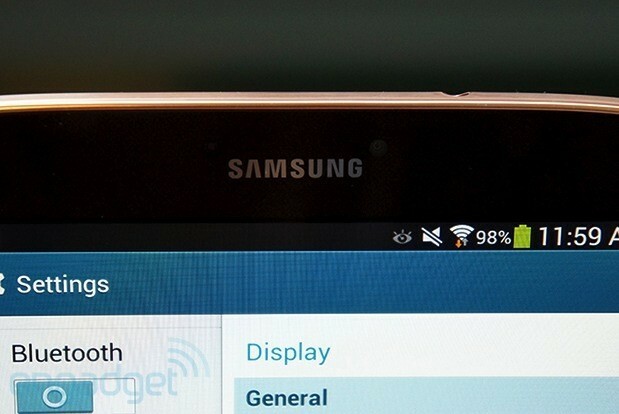 Outside of Samsung's ecosystem, you have a few other options as well. The new Nexus 7, retailing for $229 and up, has wireless charging and a brilliant 1080p display in its favor -- not to mention a very reasonable price. And if you're wed to the 8-inch form factor (and open to another OS), the 7.9-inch iPad mini's impressive battery life and access to the App Store could be good reasons to shell out $329-plus. The bottom line is that both of these options are far more memorable than Samsung's latest 8-incher, and we're coming to expect standout features on tablets in exchange for our dough. Our biggest knock against the Samsung Galaxy Tab 3 8.0 is its finicky performance, which admittedly is no minor complaint. Beyond that, though, the biggest fault we can find with the Tab is that it's simply not memorable. Sure, if you have $300 to spend and want an 8-inch Android tablet, it's an option worth considering. Is it the best use of your money, though? No, you can do better for a little more cash -- and even a little less.